Faculty: Armando Bolmey, Jennifer Mason Lobo, and Aaron Pannone. 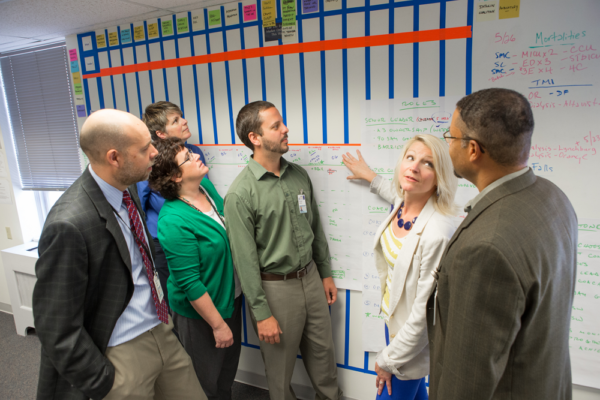 The purpose of the Be Smart Faculty Section is to advance education and the science of patient safety and quality to reduce preventable harm to patients and team members, improve clinical outcomes and experiences, and reduce waste in healthcare delivery systems at the UVA Health System. As a complement to UVA’s Be Safe initiative, the Be Smart Faculty Section will build and expand on existing programs to train students, faculty, and staff in clinical care improvement and to promote research that defines best practices for our institution and helps inform practices outside of UVA. The Section will integrate educational, research, and clinical care forces across Grounds at UVA into a community that is focused on developing, testing, and studying challenges to quality and patient safety and identifying solutions that can be implemented and sustained. To provide alignment of research efforts with the goals and activities of the UVA Be Safe initiative. To augment Be Safe training to educate faculty and staff to be effective team members to improve clinical care, patient safety, and systems thinking by offering of a variety of classroom, online, and other educational opportunities. To lead research efforts focused on quality and safety in health care that will help reduce disparities, improve efficiency and value, establish best practices, and enhance a health system culture that values collaboration, accountability, and organizational learning. To support the scholarly activity of student, faculty, and staff in improving safety and quality through the provision of value-added consultative services and technical support (study design, hypothesis development, acquiring/collecting data, analyzing data/statistical support, assistance with writing and submitting abstracts and manuscripts). To promote the sharing and publication of new knowledge both within the UVA community and with peer institutions, patients, and other stakeholders.